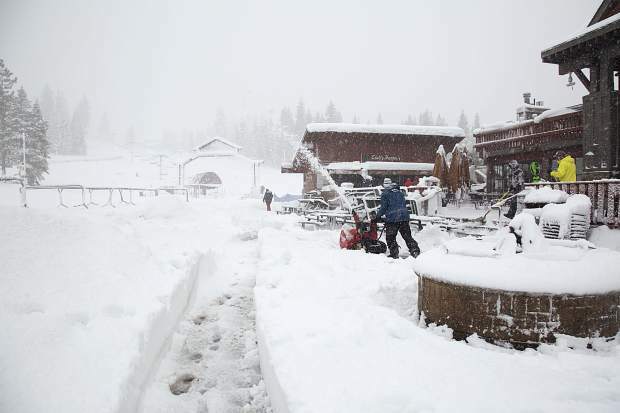 Northstar California Resort reported more than 4 feet of snow from this past week’s storm. The biggest storm of the year packed the punch forecasters called for, walloping the Sierra Nevada with several feet of snow, and wreaking havoc on local highways and roads. Earlier in the week, the National Weather Service Office in Reno issued a blizzard warning for the greater Tahoe area, a rare report since 2008. The warning was for the second of the two systems that hit the region this week. “We only use blizzard warnings for systems that are at the top end,” said Chris Johnston, meteorologist for the National Weather Service Office in Reno. The warning extended from 7 p.m. Wednesday to 7 a.m. Thursday. The weather service’s forecast of a powerful winter storm proved accurate with wind gusts of more than 100 mph, several feet of wet, heavy snow, and a number of avalanches across the Sierra. Extreme weather was reported across the region after Wednesday night’s storm. Farther south in the Sierra, Mammoth Mountain had sustained winds of 132 mph and gusts up to 164 mph were reported. The Sierra Avalanche Center reported seven avalanches across the area, all occurring on Wednesday. Travel in the Truckee area during the past week has been impacted by road closures, a number of wrecks, jack-knifed semis, chain requirements, and an avalanche, which caused the partial short-term closure of a lane on Interstate 80. Regional ski resorts, which had seen scant snow until recent storms swept through earlier this month, reported several feet of fresh snow in the past few days. Squaw Valley Alpine Meadows reported a seven-day total of 53 inches at Squaw’s upper mountain as of Thursday morning, while Alpine Meadows received a reported 38 inches of snow piling up this past week. Northstar California was hit with 50 inches of snow this week, building an average base depth of 81 inches. To the west of Truckee, Boreal Mountain reported 43 inches of snow for the week as did Soda Springs. Nearby, Sugar Bowl reported a seven-day total of 46 inches. Tahoe Donner picked up more than 40 inches at the downhill area and 17 inches at the Cross Country Ski Center. Across the lake, Heavenly Mountain Resort received 19 inches over the course of the week. Friday will be mostly cloudy with an overnight low of 22 degrees, the weather service said, followed by a partly sunny Saturday with a high near the mid 40s. There will be a brief period of calm weather Sunday morning, followed by an increase in winds and a chance of snow over Sierra passes. Next week, cold and dry temperatures are expected for the region, which will likely last through the end of the month. “It looks like it’s going to struggle to get out of the 40s even down here in Reno for next week,” Johnston said. The next chance of snow for the Truckee-Tahoe area will come at the end of the month. “A lot can change just because of how variable the pattern has been this winter,” Johnston said of the likelihood of a storm hitting the area by month’s end.